This article describes a method using printer’s ink to create a wood grain surface. For a method using photographic images and modern color printers, see Faux Wood Burl Walnut. 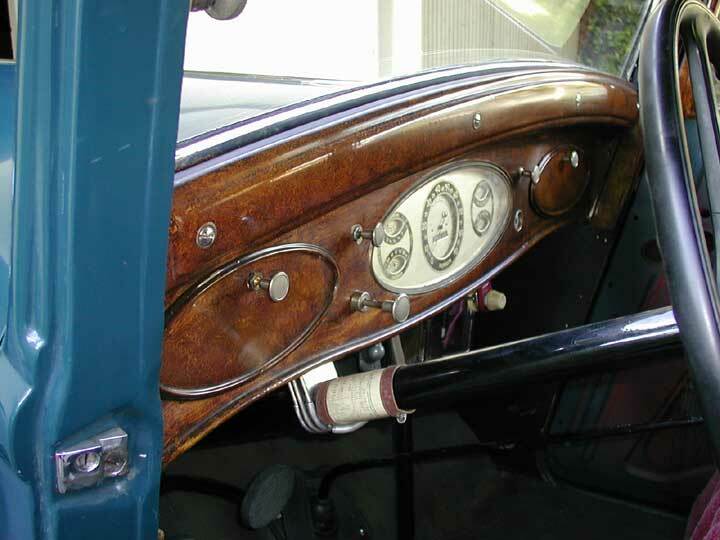 I followed the procedures described in Woodgraining: A New Approach [Dunham 1980] to refinish the dash and window moldings on my car. General techniques for woodgraining antique car dashes are covered in this book as well as some specific techniques needed for some models. The procedures are straight forward and it is fairly easy to achieve reasonable results. I should state at this point that I working toward a touring vehicle that is reasonably authentic. The woodgraining I achieved is not of the quality required for winning at a national level car show. I think the techniques described in the book can be used for show winning work but it will take more practice and time than I put into my car. I should also state that [Dunham 1980] is out of print at present. I have contacted the publisher and they state that there is demand for a new edition. 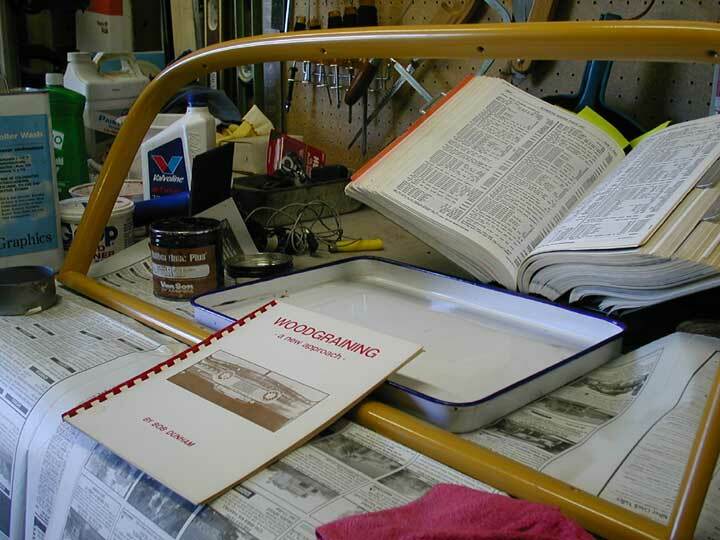 However the base and clear coat lacquer materials described in the book are no longer available everywhere and they don't have the resources to do long term (greater than two year) material compatibility tests. They feel that this testing is required before they could update and print the book again. However the interest is high enough that they are planning on producing a series of articles in Skinned Knuckles , a magazine which is printed by the same publisher. Those articles will cover the general techniques and mention the the material compatibility issues but not recommend any one base or clear coat material type. As of June 29, 2004, I am not sure when those articles will be published. The technique starts with a base color paint. I see articles that advocate using a light brown for the base coat. The color I used is based on a sample found under a section of the dash when the car was disassembled. To my eye it is a mustard yellow. I found the rubber based cocoa brown ink and press wash at a local printer/paper supply company. A little goes a long way. To do all the woodgraining on my car used less than a teaspoon of ink. The small ink can shown in the background is probably enough to do several hundred cars. 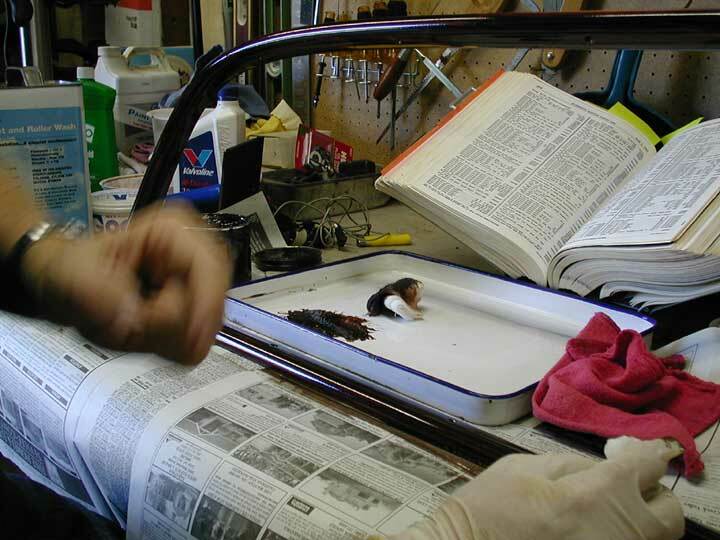 A little ink (the size of a pea) is mixed with press wash until it is liquid. Use a folded up piece of cheesecloth to mix and apply the ink. A thin coat of ink is spread over the surface. It does not have to be perfectly uniform. Using either the same piece of cheesecloth or another, dab the surface to form the wood grain pattern. You can also use wadded up newspaper for a rougher pattern. “Birds eye” knots can be made with Q-Tips. If you don't like the results, then use the press wash to clean all the ink off the part and start over. You can do this as many times as you want and you can take as much time as you want to get the pattern correct. 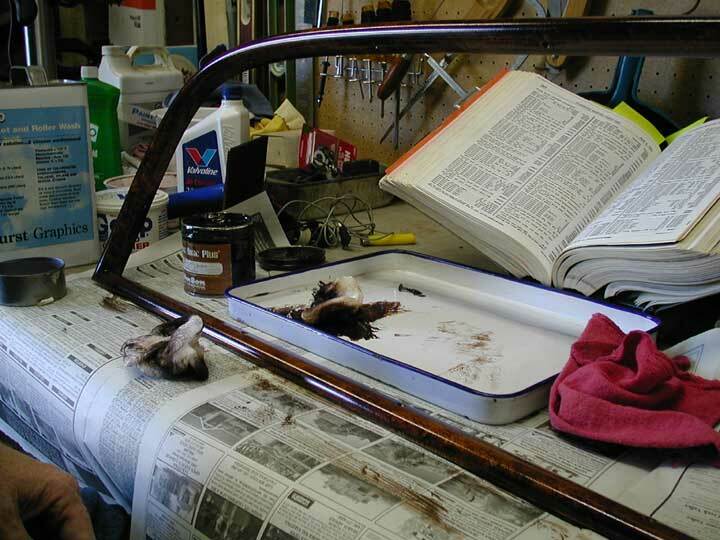 When you get the results you want, let the part dry for several days then seal it with a clear coat of lacquer. Here is how my dash came out. I don't think it is too bad for a first try.